Keating Chambers is recognised as a leading set for public procurement. Our procurement practitioners are above all expert advocates. Led by Sarah Hannaford QC, the “doyenne of the Public Procurement Bar” and the “tenacious” Fionnuala McCredie QC, they appear in many of the most high profile cases (e.g. NATS (Services) Limited v Gatwick Airport, ALSTOM v Eurostar and Roche v Mid Yorkshire Hospital Trust). With a “gifted team of talented silks and juniors” providing strength in depth, and “undisputed acumen when handling procurement cases”, we are often instructed to represent both sides of the dispute (as in Geodesign Barriers Ltd v The Environment Agency). Our breadth of expertise is wide, with members instructed in a variety of cases relating to transport, energy, IT and healthcare. We appeared recently in the cases relating to legal aid services procurement (R (on the application of Fair Crime Contract Alliance) v Lord Chancellor (Legal Aid Agency) and have recently acted in the first case on new competition and procurement regulations for NHS services (R (on the application of QSRC) v NHS England). We are also strategic advisers to authorities and bidders often involved at all stages of the tender process from design to debrief. Described as “Commercial, un-stuffy, client-friendly, committed, personable”, our barristers see things from the client’s perspective. We also have strength in depth with “rising star” Calum Lamont, Paul Bury, Tom Coulson and Harry Smith all acting in recent procurement cases. As former competition partners in leading law firms, Simon Taylor and David Gollancz (both members of the Attorney-General’s panel of counsel) are competition as well as procurement specialists. Their years of experience encompass European Commission and CMA investigations as well as litigation, in the area of anti-competitive agreements, state aid, merger control and abuse of dominance. 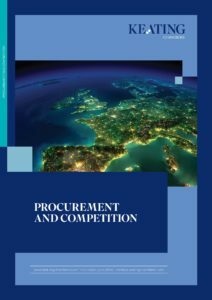 Both are specialist in public and utility markets where procurement, competition law, state aid and sectoral regulation meet and increasingly their cases cross the divide of these disciplines. Our members regularly contribute to legal publications and are in demand as speakers at procurement conferences. New procurement regulations for NHS healthcare services: big bang or business as usual?